Eduardo A. Gibbon y Cárdenas (full name Eduardo Anacleto Jesus Maria Antonio Gibbon) was born in Mexico City on 13 July 1845 and was a 19th century Mexican art critic, journalist, writer and diplomat. His father was born in England, his mother was Mexican. As a young man Gibbon was one of the private secretaries of the ill-fated Emperor Maximilian (who was Emperor of Mexico from 1864 to 1867). In 1874, Gibbon was elected a Member of the Mexican Society for Geography and Statistics. He wrote several books, including La catedral de México (1874) and Reflexiones sobre arte nacional (1892), and a Spanish translation of Felix Salm-Salm’s memoirs about the final days of Emperor Maximilian. Gibbon also translated Father John S. Vaughan’s work, “Life after Death”. According to the brief obituary of Gibbon in The Sun (published in New York), he was also “the author of various novels”. While holding a diplomatic position in London, England, in the 1880s, Gibbon took the opportunity to write Nocturnal London, published by S. E. Stanley in 1890. He later also served as a diplomat in the United States. 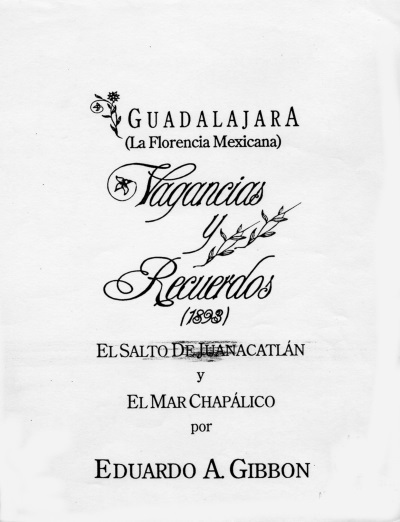 In 1893, Gibbon published Guadalajara, (La Florencia Mexicana). 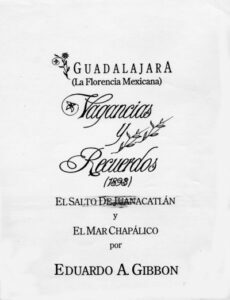 This is essentially a popular guide to the author’s chosen trilogy of major attractions in Jalisco: Guadalajara, Juanacatlán Falls (the “Niagara of Mexico”) and Lake Chapala. Gibbon’s writing is poetic, verging on the flowery, but despite that many of his descriptions make for interesting reading. Gibbon’s romantic, poetic prose about his trips to Lake Chapala, in 1893 or earlier, includes one of the earliest detailed accounts of a boat trip on the lake. He also mentions the fact that deposits of petroleum have been located under the lake, and that studies are being undertaken to see if the deposits are large enough to be worth exploiting. We entered along a straight and long road, like those that form the main street of every village. The houses were of a single story, with white or colored facades. The doors and windows of wood; the latter without bars or glass, showing that in the honored home of the fisherman, they are safe even without these luxuries. So it is just as easy to enter one of the homes here, through the windows, often obstructed by the pots full of flowers or the large cages of melodious birds, as it is through the doorway. A soporific silence, that in this village of fishermen! So quiet that, at mid-day, only the buzz of the clouds of gnats, and the beating wings of the gulls crossing the sky can be heard. But the great luminous place was at the end of this street: Lake Chapala. A fishing boat, with its lateen sail, was approaching the port. Apart from that, nothing was in sight on the immense surface of the water, on which the afternoon sun shone, producing lights and shadows like those made by marcasite…. Eduardo A. Gibbon, who was unmarried, died at the age of 51 in Mexico City on 19 May 1897 following a lengthy illness. This post, based on chapter 37 of my Lake Chapala Through the Ages: an anthology of travellers’ tales (2008) is an updated version of a post first published on 19 September 2016. The Sun (New York, New York), 21 May 1897, p 5.